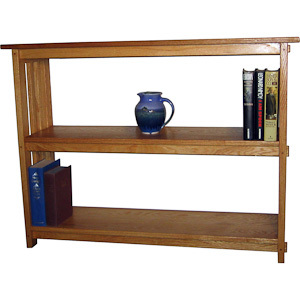 The Cape Neddick Mission Through Mortise Tenon bookcase is produced in the classic mission style with through mortise joints showing the tenon used to support each shelf. This exquisite joinery shows the beauty of the craftsmanship as well as provides for a very strong joint to support heavy books and objects. This bookcase has an open back and can be viewed from either side thereby allowing it to be used as a room divider. All shelves are fixed in spacing. A 36" width is shown. Other widths can be custom design to meet your specific needs. All shelves are fixed in spacing.